The Chord Company launches Epic Reference cable | What Hi-Fi? The Epic Reference is an upgrade to the previous Epic speaker cable, and claims to bring out the best in music from a wide range of equipment. 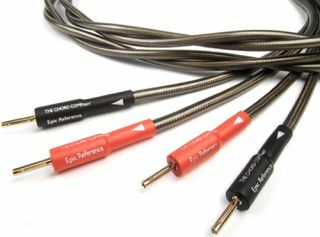 The Chord Company has launched the Epic Reference analogue speaker cable. An upgrade to its previous Epic cable, the latest version claims to provide greater accuracy across a wider bandwidth, as well as having the benefit of using a seperately shielded conductor construction. The Epic Reference builds upon the shielded-constructor design used in the previous model, by adding a new separate, high-frequency-effective shield to each conductor. The company claims this brings the Epic Reference closer to its top-of-the-range Signature series. Two 12 AWG 19-strand silver-plated oxygen-free copper conductors make up the cable, and a twisted-pair composition has been used. Chord has used PTFE (Polytetrafluoroethylene) insulation too, which it says provides the most neutral tonal characteristics. The external jacket is PVC. The Chord Company Epic Reference cable is available now, starting at £125/m.